Ostermann provides carpenters/cabinet makers with a large selection of handle profiles. There are 35 different models to choose from. In addition to the popular aluminium variants, there are as of now 2 appealing recessed handles made of solid wood. Handle profiles and handleless systems give fronts or sliding doors a distinctive character and an exquisite design. Moreover, the handles offer the opportunity to cover the edges of cut surfaces with an elegant and practical solution. In the Ostermann online shop, you can choose from 35 different models, each of which are available with several surface variants/colours. With Limbo 1 and Limbo 2, Ostermann offers 2 appealing handleless systems made of solid wood. These are particularly easy to process for the carpenter/cabinet maker and add a natural touch to kitchens, living and working areas. You can choose from two different wood types, oak and walnut. As accessories, matching end caps and an assembly kit are available. The new handleless systems are supplied in cut lengths with a standard length of 2450 mm. Aluminium handle profiles are available at Ostermann in cut lengths, with a standard length of 2500 mm. While solid wood handles can easily be shortened by the carpenter/cabinet maker, not every workshop has got the time and/or the tools to professionally cut and process the aluminium profiles. Therefore, Ostermann delivers all handle profiles made-to-measure upon request and from a length of 200 mm. In a first refinement stage, the profile is cut with millimetre-precision. In a second step, the bar is trimmed at both ends of the profile. Finally, the cut edges are chamfered and finished. Bumps and traces of sawing are then being removed. The customised handle profiles are ready for dispatch within 3 days after ordering and are then sent to you ready for mounting. 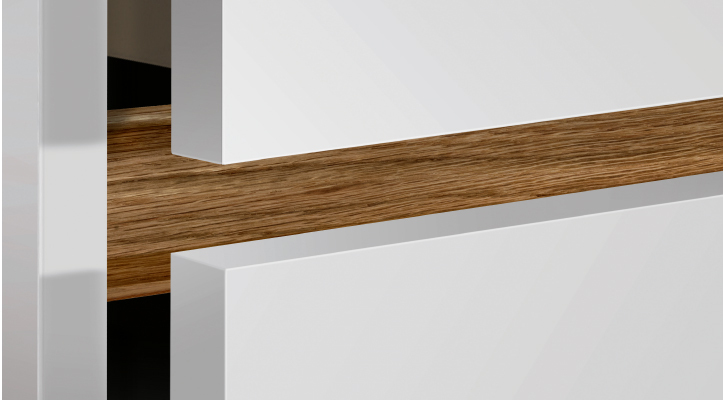 All information on the new handle profiles can be found when typing in the search item "real wood edging profiles" at the Ostermann website www.ostermann.eu.